The Third Battle of Ypres, which began on 31 July 1917, was the most notorious British battle of World War 1. The battle saw some successes, but, the final stages developed into a quagmire of mud around the village of Passchendaele. The battle was preceded in June 1917 by the capture of the Messines Ridge and we will include sites from The Battle of Messines in the tour. 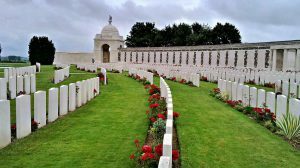 It is not yet possible to provide a final itinerary for The Ypres Centenary Battlefield Tour as the official programme of Centenary commemoration events has not yet been published. However, our current plans are described below. We will also ensure that anyone with a ticket to an official commemorative event is able to attend. We arrive at Calais and en route to our hotel, we visit The Messines Ridge. The explosion of a series of massive mines beneath the ridge was reputedly heard in England and the landscape is still scarred with craters from the explosions. We then drive to our hotel, where dinner is included in the tour price for the first night. We begin the second day with a visit to Tyne Cot Cemetery and Visitors Centre, the largest British war cemetery in the world. Before lunch we stop in Passchendaele, the village which gave its name to The Third Battle of Ypres, and is now the site of the Canadian memorial and the magnificent 66th Lancashire Division memorial window. The afternoon and evening will be spent in the town of Ypres. 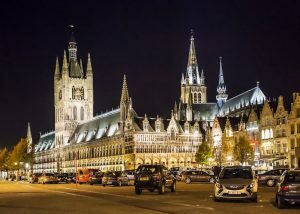 A highlight of the day will be a visit to the In Flanders Field Museum in the restored Medieval Cloth Hall, which is staging a number of special exhibitions for the Centenary. We will remain in Ypres for the remainder of the afternoon and evening for an unforgettable day of commemorations concluded by the Centenary Last Post ceremony at The Menin Gate. On day three we tour the Ypres battlefields a hundred years to the day of the opening attack of The Third Battle of Ypres. We begin the day at Hooge on the Menin Road, the high ground above Ypres and a key British objective. Our next stop is at Railway Wood, one of the most fiercely contested pieces of ground and still scarred by numerous mine craters. We move on to The Scottish Memorial on the Frezenberg Ridge, from which there are sweeping views of the battlefield. After lunch we begin the afternoon at Essex Farm, the site of a dressing station and inspiration for the poem, “In Flanders Field” by John McCrae. Pilkem Ridge was captured on the first day of the battle of Passchendaele and our next stop is at the Welsh Memorial sited on the ridge. One of the most famous casualties at Ypres was Harry Patch and we stop next at his memorial and the place where he was wounded. Our last stop is the atmospheric Langemark German Cemetery, the resting place of 44,000 German soldiers. On our final day, we stop at Brandhoek, the burial place of Noel Chavasse, the only person to be awarded two VCs during World War. We then visit Talbot House, the evocative preserved soldiers’ place of rest and recreation. Our tour completed, we drive to Calais and begin our journey home. There are no additional charges for entry to museums or any of our excursions. We donate 10% of all profits from Guided Battlefield Tours to Pula Children’s Trust, a charity which gives aid to children in Africa. A donation of £1 will be made to The British Legion from each booking. Tour Price: £545 per person sharing a twin or double room (Includes dinner on the first night). There is a single room supplement of £65. The hotel for this tour is the four star Altia Hotel, Neuville-en-Ferrain. You can see the hotel at: https://www.altia-hotel.com/ The tour price includes dinner at the hotel on day 1. On day two we will stop for dinner in Ypres before attending the Last Post ceremony at the Menin Gate and on day three we will offer the option of going into Kortrijk for dinner.